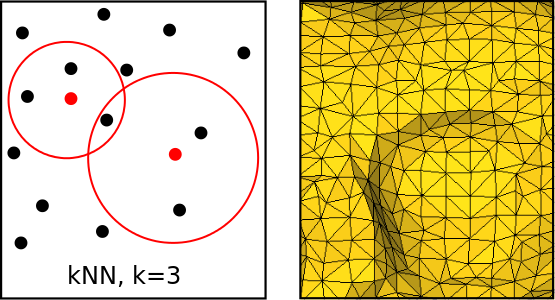 A common problem in computer science is to construct a spatial data structure (octree, kd-tree) and use it to search for k-nearest neighbors (kNN). In surface reconstruction from dynamic points (real-time), both construction and search time are critical. As points on a surface are a sparse distribution in 3D, this can be exploited by mapping them into screen space (2D), as shown in "Auto-splats" (Preiner 2012). Our approach is to also exploit spatial coherence in screen space to find kNN for points. The performance is maximized by a CUDA implementation designed to minimize memory-boundness. An preliminary implementation exists which constructs a packed quadtree and reads kNN from a quadtree node density estimate. A few improvements have to be made to optimize performance and to analyze results. Optimize an existing CUDA implementation which reads coalesced points from a packed buffer. Read kNN candidates grouped of close points to minimize global memory accesses. Clean up code for release as an open source project. Good optimizing skills. Experience in shader programming. CUDA experience is a bonus. Note that we provide a €500,- funding for women, contact me for details. For more information please contact Stefan Ohrhallinger (ohrhallinger@cg.tuwien.ac.at) or Michael Wimmer (wimmer@cg.tuwien.ac.at). Last update by Stefan Ohrhallinger on 7. Nov 2018. Comments to stef (at) cg.tuwien.ac.at.